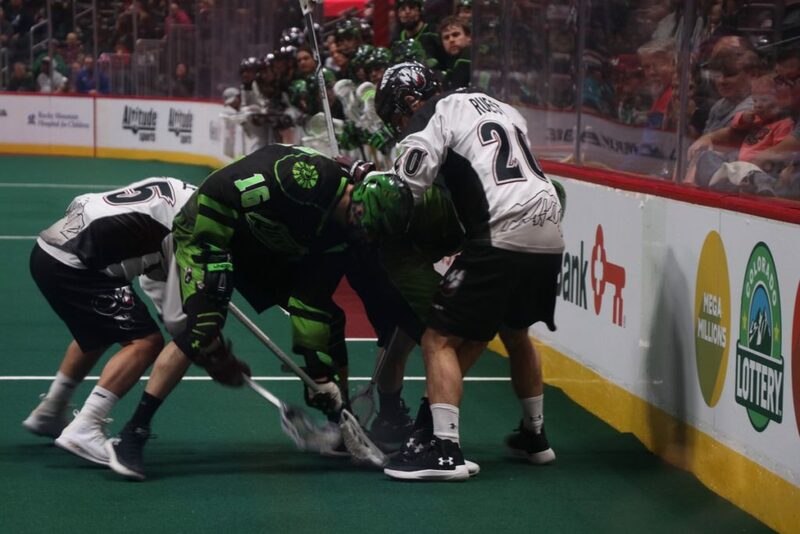 Joey Cupido scored fourteen seconds into tonight’s contest and the Mammoth were able to keep Saskatchewan off the scoreboard for a full eight minutes, but even this hot start proved to be insufficient against the division-leading Saskatchewan Rush. Riding the momentum from a two-goal run to start the quarter, the Mammoth dominated play throughout a majority of the first. To put it simply, Colorado looked like Colorado. The same gun-slinging offense that dominated in the first three games took the floor once again tonight and seemed to be well on its way to a close battle with Saskatchewan. The Mammoth offense was steamrolling once again. Then, the train derailed. For the first time in 2018, the Mammoth showed their weaknesses. Colorado never held the lead after the first quarter, which ended deadlocked at three goals apiece. The Mammoth kept the game tight throughout the first part of the second quarter, but an eight-minute scoring drought to end the half enabled the Rush to take an 8-5 lead heading into the break. The second half would prove to be all Saskatchewan. Three goals from Curtis Knight in the third quarter, as well as three more from Rush forwards, powered the boys from up north to a 14-7 lead. Eli McLaughlin and Jeremy Noble tried to make things interesting in the final period, but the Rush’s lead proved to be insurmountable as Colorado fell to the Saskatchewan Rush by a score of 17-12. The biggest red flags from today’s contest come from unexpected, yet easily correctable areas. Colorado only found the back of the net twelve times on 44 attempts. While goalie Evan Kirk is a stud between the pipes for Saskatchewan, Colorado’s 27% shooting percentage could have been in the upper 30’s. One particular stretch in the fourth quarter saw Colorado take three to four shots per possession, dismally resulting in zero goals. One additional problem-area for Colorado was at the faceoff circle. Colorado won only 14 of the 33 faceoffs taken during the course of the night. This problem seems to be one plaguing the Mammoth throughout the season as Colorado has only won the faceoff battle in one contest thus far. With the loss, Colorado fell to 3-1 on the season while Saskatchewan improved to 4-0. Colorado now holds sole-possession of second place in the Western Division. Colorado will have an off week next week before hosting the Vancouver Stealth on January 26th. Colorado will see the Rush three more times this season, with the next meeting coming on February 2nd at the Pepsi Center.